Originally published as an update to TWFK Kickstarter on April 8, 2018. Desiree' Pittman is my wife, best friend, studio mate, and accomplice in the ultimate crime that is human existence. These are not the reasons my wife is in this gallery though. Dez and I started dating over the phone really. I was on a break from NYC, staying at my Mom's place in WI after school, having needed to get away as my anxiety was at an all time high. I was alone in the city, and walking down the street could cause panic attacks, and I could end up crying for no reason. I had recently lost my Aunt Barbara, and life was unfortunately too hard to be by myself. Dez and I had a class together in SVA, but we ironically had NEVER spoken to one another in class. One random day while I was in WI, I get a message from Dez out of the blue on good old MySpace. At first we just messaged each other everyday sending each other cartoons from explodingdog.com. Eventually we started to talk on the phone bonding, and watching Aqua Teen Hunger Force every night together. It was also during this time, that I got to see what Dez was capable as an artist. Dez's ability to capture a person in a portrait was on a whole different level than I had seen before. The figurative draftsmanship is something I always to this day admired. She also has this knack for capturing sadness, and dark in the world with her art. Dez's favorite character in The War for Kaleb is Addey. And it should be. Addey is my wife, and my wife is Addey. They love their respected partner's with every fiber of their being, unconditionally, without any thought of reward for their affection. It exists, pure and simple with no motive other than it being an extension of their character. I think Dez's piece captures this perfectly. Addey's worrisome hand on Kaleb's shoulder, with their shared melancholy. The mysterious darkness is there lurking beneath, but Addey has no idea where to dig. It is based off of a consistent response I get from Dez "I wish there was something I could do to make you feel better." This is the true reason Dez's artwork is in this book. This story belongs to her just as much as it does belong to me. One of the reasons I wrote this book was to find a way to be a better person to my wife, and also give Dez the understanding of seeing the world through my eyes, the best I could. Today is also Dez's birthday, and this is part of my gift to her, but everyday I live with her is a gift to me. Every Tuesday night at the Joe Kubert School of Cartooning, Clinton House dorms, me and the rest of my housemates, would crowd into our buddy’s tiny room. It was the only room in the house that had cable. There we would, like clockwork infringe on our friend’s boundaries, and personal space to watch the newest episode of Buffy the Vampire Slayer. No matter how much it annoyed him, he let us come in and watch because he is a good friend. This is Adam Walmsley. Like the good friend that he is, one day, after Adam had read the first two issues of The War for Kaleb, he, out of the blue, posts a drawing of The War for Kaleb that he did, on Facebook. This is the very first time that I had ever seen my characters drawn by someone else. The best part is, that I never asked. The book spoke enough to Adam that he took it upon himself to do the amazing piece. I get too sentimental, but it brought me to tears. I’ve said it before, but art is the closest thing we will get to seeing the world through someone else’s eyes. The way he saw my characters were different than the way I do. But the integrity that makes the characters, are still intact. What is amazing about Adam’s piece is that he gave all the different characters a slightly different look. Like a spectrum of anxious evolution. 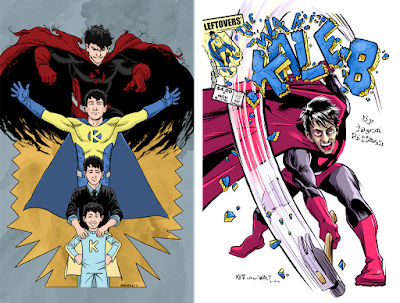 Starting when Kaleb is a bright-eyed boy, to a worrisome young man, to his light superhero representation with a slightly larger build, and then the overarching, menacing dark hero to loom over Kaleb’s every desire and ambition. It is subtle, but it is there. One of the things that I have always noticed about Adam’s work is how exceptionally clean his style is. Every line matters, and nothing is wasted. It is confident and demands to be looked at. Even when we would argue about stupid “nerd” stuff like whether or not the Star Wars Prequels were good (they are good, sorry Adam), or whether or not he should let 6 other people in his room to watch a stupid TV show, Adam has always been a great friend, and I’m proud to have his work as an addition to this book. I was a Star Wars kid, born in 1978, grew up in the 80s', fell in love with comics in the early 90s' and discovered Punk Rock around the same time. Jim Kettner is cut from almost the exact same damn cloth as me, age and everything. When I read Ink in Water written by Lacy J. Davis, and drawn by Kettner, I fell in love with his art. The book follows the journey of the author, Lacy, living with an eating disorder. It is an extremely powerful book of self defeat, self abuse, self care, and self discovery all the same. A lot of the themes captured there very much echoed some of the themes of The War for Kaleb. The thing that really drove the themes home in Ink in Water was the amazing art of Jim Kettner. It was the first time I really saw the darkness, and all consuming power of mental illness visually represented the way he does. He also gives us a glimpse of what it was like for someone like him to grow up reading comics, and coming of age in a punk rock scene. It was only appropriate that I ask Kett to draw Kaleb for me. My wife, having had taken a class with Walter Simonson, back in our SVA days, decided to shoot Walt the awesome image. He retweeted it, and it made everyone's days, but probably not quite as much as Jim. It was like a seeing a kid wake up for Christmas. 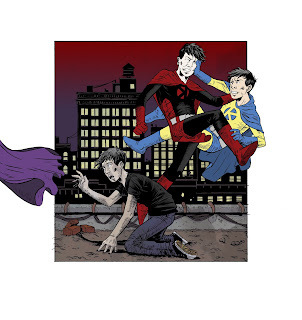 You can also see Jim's process for putting the image together over at his website Kettnerd.com. I met Ken Knudtsen through my wife Desiree', as they had classes together at the school we all went to, The School of Visual Arts. Ken is the writer/ artist for the awesome little indie title My Monkey's Name is Jennifer. We specifically met at the Long Island Comic Con some years back, and I fell in love with his artwork. He has a style that embraced that of the blind contour drawings I used to do in college. Blind contour drawings are done by looking at what it is you are drawing, NOT looking at the paper, canvas, or what-have-you, while you are drawing. The drawing doesn't usually end up looking like anything. In turn, you get a drawing that exemplifies the artist's pure mark. It is an exercise used to let go of one's inhibitions, and just let honesty do the drawing. Ken's work does look like the things he is drawing, but keeps all that honesty intact. One of the goals for the gallery was to have a diverse group of styles. 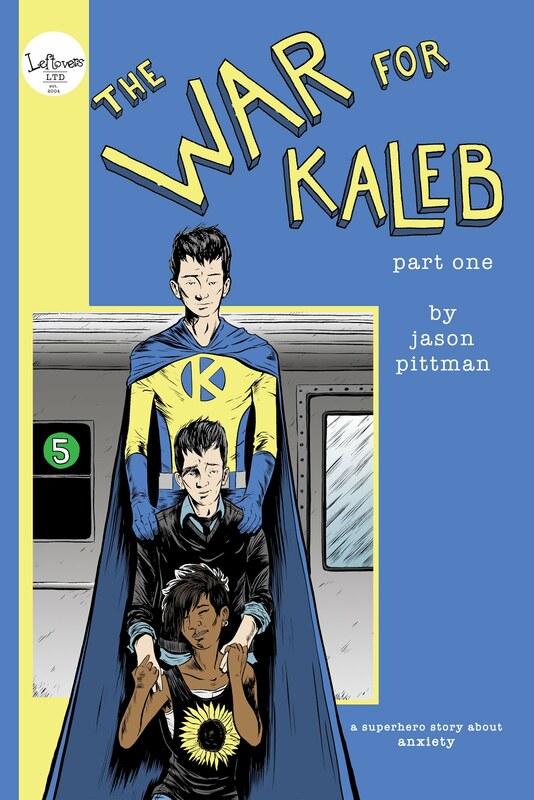 Ken fit that bill perfectly by creating a beautiful ominous drawing of the gritty rooftops of NYC, the inner peace that Addey and Kaleb find in each other, with his fun little easter egg, nodding it's way back to my story. I will be posting some more fun updates, showing off the talented individuals that too part in making this gallery something special. Please consider backing, and/or sharing. The War for Kaleb Kickstarter Launched! 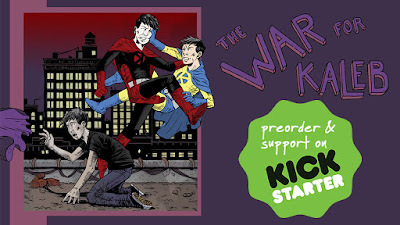 We launched the Kickstarter campaign today for the collected edition of The War for Kaleb! The graphic novel will include a brand new epic cover, new content not in the original single issues such as a forward by Shelley Briggs Callahan, author of House of Life, an extensive gallery with many talented individuals, a sketch gallery, and behind the scenes section, and an afterward by myself. The idea of creating a graphic novel has always been something exciting for me, as it is my preferred way to read comics. I love having the entire story in one place, and I adore the format. I love seeing the collection of graphic novel spines on my bookshelf, thumbing through them, and finding the gem that I’m in the mood for at the time. The final book will come in at 104 pages, and will have a run of 1500 copies. Also with the launch of the Kickstarter is a special movie style trailer, and mini documentary about the book, with original music, and editing by Dan Schepleng! Ever since I saw the comic book trailer for Ultimate X-Men in the early 2000’s I wanted to do something similar, and I feel The War for Kaleb trailer came out wonderful. The music is epic and truly captures Kaleb’s internal conflict turmoil. The Kickstarter will last until April 21st so there is plenty of time to get in on it if you desire. If you can’t pledge, please share, share, share! The true strength of crowdfunding comes from word of mouth, so I can’t thank everyone enough for just simply spreading the word! Thank you everyone for your support in the past, and hopefully for the Kickstarter! 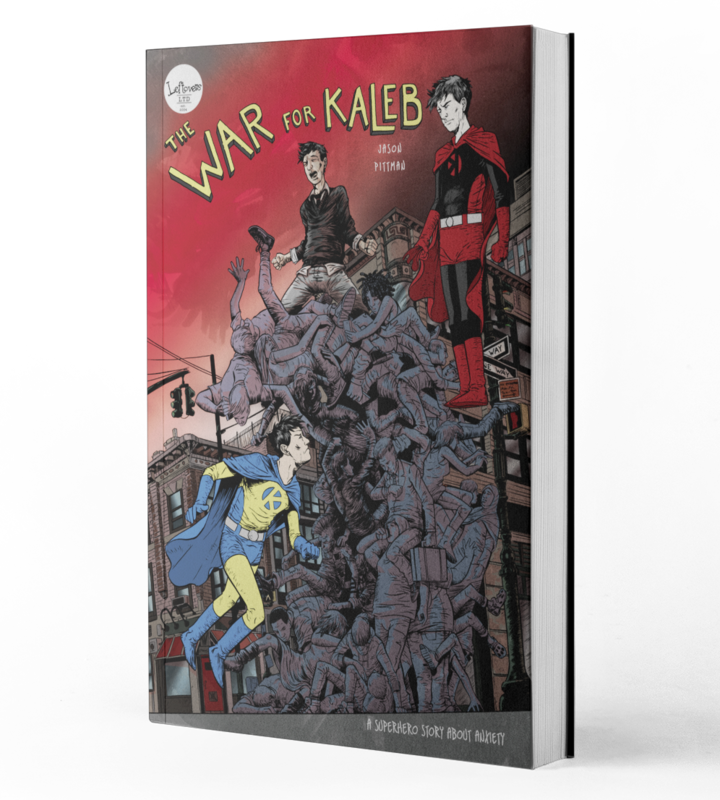 As a bonus the fine folks over at A Place to Hang Your Cape, has written a flattering review of The War for Kaleb #2, just in time for the Kickstarter launch! 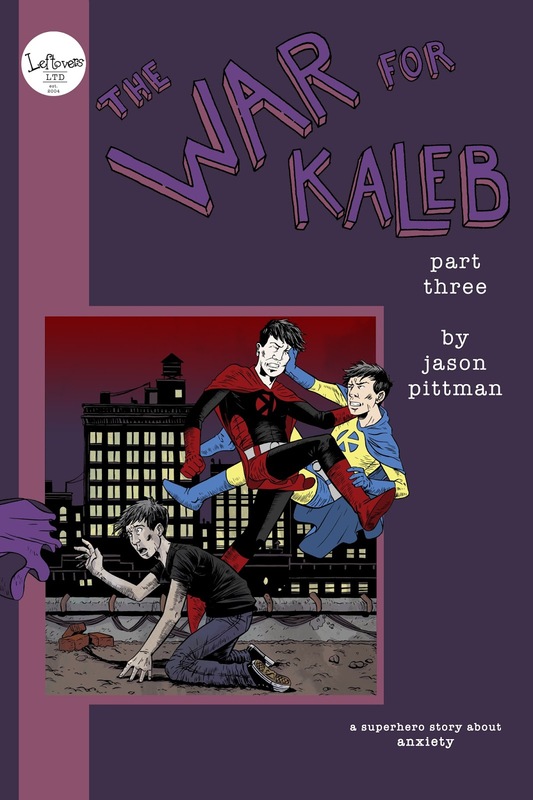 "In every aspect, The War for Kaleb #2 is an improvement on an already stellar original. It escalates, complicates, and deftly prepares for the story’s finale. It is bittersweet then, that Issue #3 will be the last for this extraordinary comic." I finished the cover for The War for Kaleb Part 3, and am only 4 pages from being finished with the drawing at the time of writing this. After that, I will be working on the scanning, corrections, and color, which shouldn’t take too long. 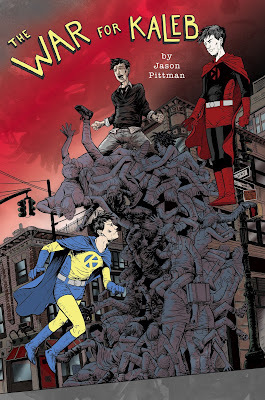 I’m pretty excited about finishing up this series, and am apologizing in advance for the issue taking so long. I hit some personal road blocks, and it had affected the progress of getting this last issue done. This is my personal favorite chapter. It is easily the most emotional, and intense of the series, and I really hope people get that out of the story as well. Preorders for the issue are also up in my online store, so everyone can secure a guaranteed copy upon release of the book, which is looking to be sometime in Oct.-Nov. 2017. 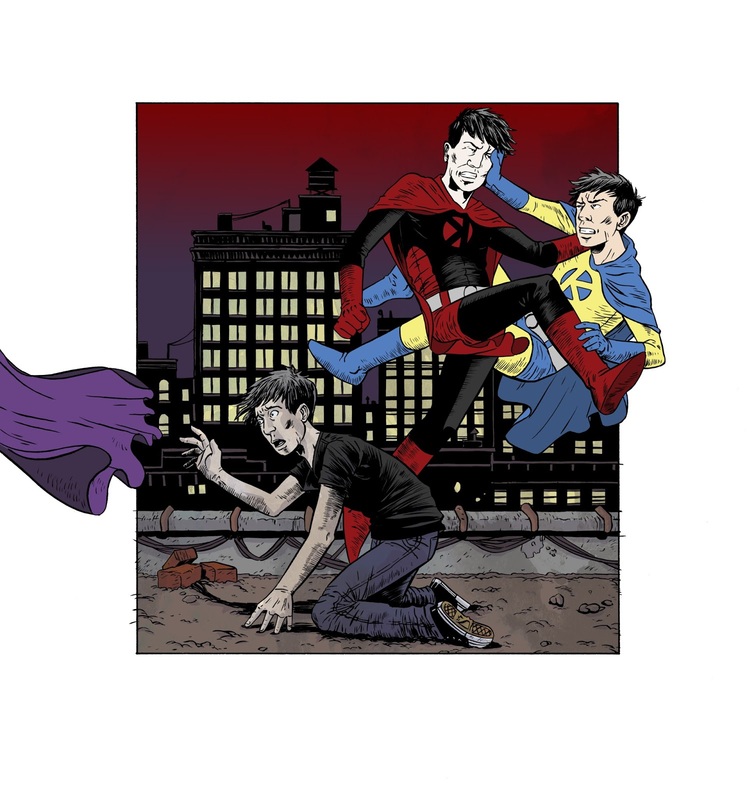 After the incident at the bar, Kaleb turns inward, as the light hero has gone missing, leaving the dark hero in control. 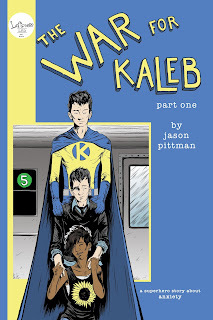 Kaleb reflects, but struggles finding any real answers for his anxiety disorder. Meanwhile, Mike and Addey discuss the next steps in saving Kaleb, and preserving their relationship with the man they care about. I’ve finished the cover for the graphic novel collection for The War for Kaleb. I’ve been struggling for a while to figure out exactly what I wanted to do for the cover of the collected edition. I knew that because this is going to be the final book, with all the bells and whistles going forward once it releases, it needed to be big, and eye catching. At first I was thinking of typical movie poster format, with all the characters on the cover. I didn’t like that idea, not necessarily that it had been done before, but mainly that it wouldn’t express what the book was about. 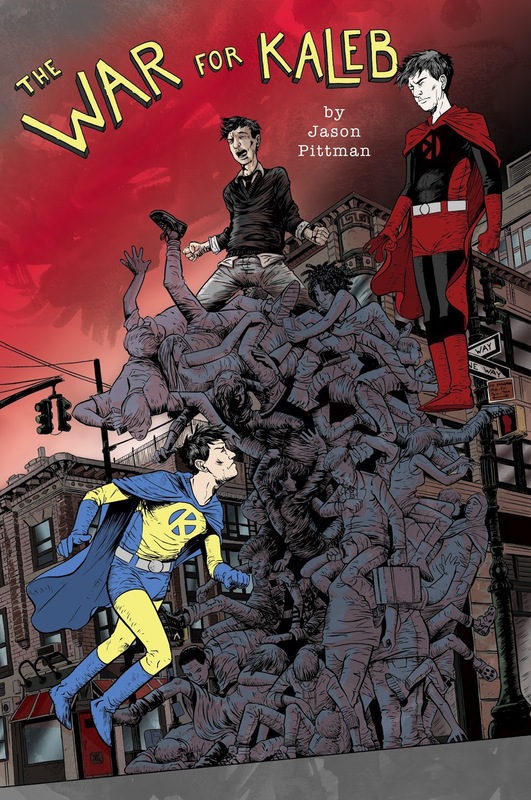 And this has always been the face value dilemma of TWFK: how to express in one image that this is NOT a book about superheroes, but really about a person suffering from an anxiety disorder. I figured since Kaleb suffers from social anxiety, and particularly from the loss of control he gets from the actions of others, I thought of this idea of a tidal wave of people, similar to the zombies from the World War Z movie. Kaleb rides atop of the tsunami of people, some that seem aware of the chaos, and others that don’t care, or even doing run of the mill everyday things; i.e. drinking coffee, checking email, taking selfies, etc. The sky is a blistering red, with the dark Kaleb sitting in the sky commanding control of Kaleb’s emotional state, with the light Kaleb being engulfed by the wave of people crashing down on his head, to extinguish the light Kaleb for good. I’m hoping that when sitting on a comic book store shelf this image will stand out. I’ve gotten some good feedback so far, and am feeling good about this image as the cover. I’m hoping I can get the graphic novel out by the end of the year, or beginning of next, as the final issue is on track to be done end of August-beginning of Sept.
Also this week, I was on a podcast for victimsandvillains.net, where I discuss The War for Kaleb, where I’ve come from as a cartoonist, and a little where I’m heading. We also talk about a few comic book, and pop culture topics, such as James Gunn’s influence of the Cosmic Marvel Cinematic Universe, and the loss of Adam West. You can listen to the podcast clicking HERE. Download "The War for Kaleb Part One" for FREE! 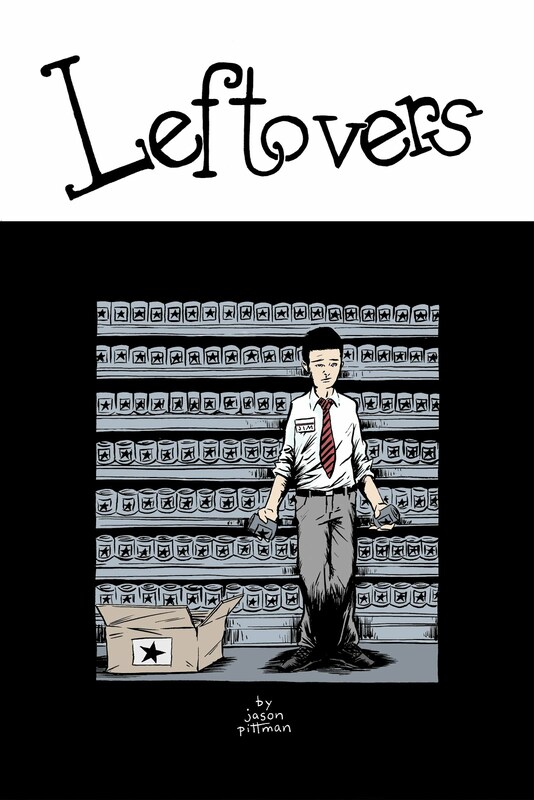 Download Leftovers #1 for FREE!